Every year the Pantone Color Guide influences fashion, beauty and of course, wedding decor! I was very excited when Color of 2013 announcement was made for PANTONE® 17-5641 Emerald, a lively, radiant, lush green. To me emerald green is a perfect color choice for a glam bride. This rich color will go well with the Edwardian and Art Deco styles, which we will see a lot of in 2013. It is also a perfect choice for a bride mixing modern and classic choices. 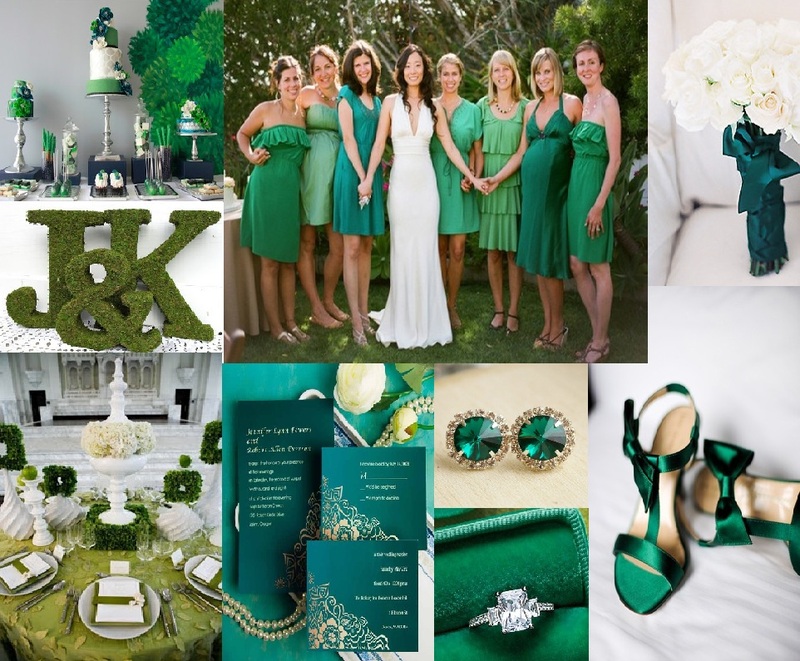 I created this inspiration board below combining emerald with shades of green, gold and white. I love the bouquet of stark white flowers with the emerald green ribbon (found on Style Me Pretty). Enjoy!